Ever get the feeling that you’re getting more and more dehydrated during long-haul or even short distance flights? You’re not alone and it’s for good reason. Sitting on a climate controlled aeroplane cruising at around 30,000ft may sound cushy, but that climate control has humidity that can be as low as 10-15%. That’s 3 times drier than the Sahara desert – so it’s no wonder that you’re feeling a bit thirsty, dry and uncomfortable. 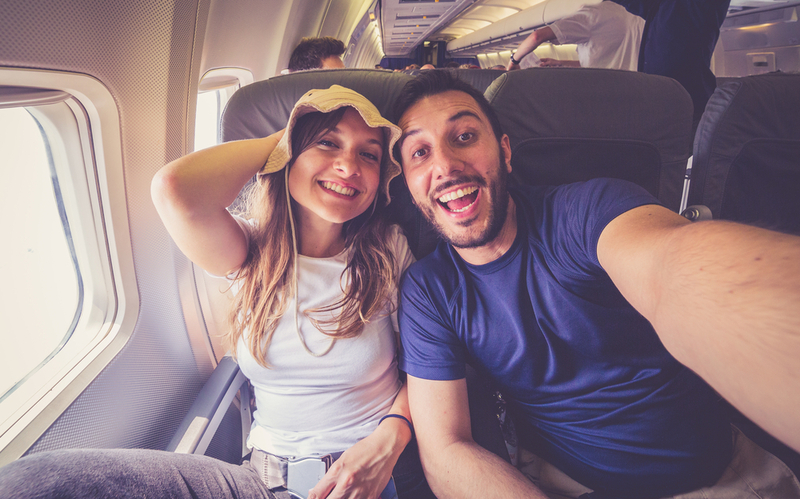 In an average 10 hour flight, men can lose approximately 2 litres of water with women not far behind at 1.6 litres. So I think it’s pretty safe to say that flying is not great for your levels of hydration, but how can you make the most of a bad situation and stay hydrated on every flight? The Aerospace Medical Association suggests passengers drink 8 ounces of water every hour that they’re in the air to prevent dehydration. To make sure that you’re keeping topped up, you’re going to need a good bottle that you can trust within your luggage. I always carry a Kool 8 BPA free water bottle with me when flying. There’s a modern, drop-dead gorgeous, fully insulated design and industrial strength stainless steel so those bangs and knocks don’t take a toll. There’s even a tea infuser for when I’m not flying (caffeine isn’t the best for dehydration) so I can use the bottle to keep drinks warm for upto 12 hours (or cold for 24). Of course, others are available, but choosing a brand that’s socially-conscious, in my mind, is vital. With Kool 8, every time a bottle is bought, 20% of the profit goes towards delivering clean water to underprivileged regions throughout the world. Although it may be tempting on the flight, avoiding sugar, alcohol and caffeine is a good idea. The tricky trio fool the body into needed to use the restroom more than it actually needs to, taking fluid from the body and, well, peeing it away. Alcohol is perhaps the worst offender with many having a tendency to keep on drinking without realising the dehydration that they’re causing to their system. It may not have much of an effect at sea level, but with 10% humidity, your head will be feeling it much sooner than expected. Stick to the water and avoid alcohol, caffeine and sugar and you should be okay. It’s not always just the throat that gets dry – chances are that your skin is also going to start to feel a little baked before long. Keeping a small amount of moisturiser in your hand luggage can help massively to restore that moisture lost back into the skin. Simply apply to the area required and you’ll be relieved in no time at all. Lip balm is a great way to prevent dryness in the lips, perfect for low humidity situations. Combine with a face mist for maximum skin hydration and you’re onto a winner. Aeroplanes are germ havens, with the air recirculated through the cabin, if someone’s sick on the plane, chances are that you’re all about to be. To give yourself the best shot of survival, dosing up on multivitamins before and after travel is a great idea. I personally opt for Vitahustle and take up to 4 capsules per day leading up to and following travelling. The Vitahustle multivitamin not only gives my body the best chance of retaining health, but gives a boost of energy through the day, from morning to night. There’s also focus and recovery benefits for the fitness fanatics among us with a support on the body’s natural defense system to aide in tissue repair. Again, other brands are of course available – but ensuring that you have trust in the company is key. When you can clearly see the ingredients and their respective amounts from a respectable company, you know you’re on the money. These hydration techniques not quite doing it for you? It might simply be a case of comfort and oral hygiene to restore normality back to your body. There’s nothing quite like brushing your teeth to feel awake, refreshed and reset and it might just be what you need to feel a little more hydrated. Nip to the bathroom, stick in a toothbrush and go to town. If bathrooms aren’t your style, Colgate wisps are a great alternative to portable teeth cleaning wherever you are. Not so surprisingly, fruit and vegetables are a key for staying hydrated with a huge amount of water contained within the foodstuffs. Berries, pineapple, watermelon, cucumber, apples and oranges are all perfect for purpose and will get you nice and hydrated. Sticking to these in sensible amounts will work wonders for the body – not only in terms of hydration, but vitamins and minerals too. It’s a win-win. It may get a bad wrap in modern day media – but sodium does have its place in this world in the most surprising on places. Sodium helps you absorb and retain more of the fluid that you’re taking in from water, fruits and vegetables. Whatever form this comes in does not matter, whether it’s a high sodium meal, electrolyte drink or supplement. Last but not least, it’s best to give yourself a head start to maximise hydration before you take off. That means eating your fruit and vegetables, drinking plenty of water and consuming sodium before take off. That way you’re just focusing on your water consumption during the flight – maximising your hydration and comfort.